I was supposed to make my husband Osso Buco for Valentine’s Day dinner, but I never got around to it….opps! I did make it for him a couple of days post V-day. I was excited that I got to use my dutch oven for the first time. Yay! Talk about heat retention and even heating! I love my dutch oven and can’t wait to use it again! Can I tell you again how much I love Giada De Laurentiis? I used her recipe to make the Osso Buco for this fabulous dinner. 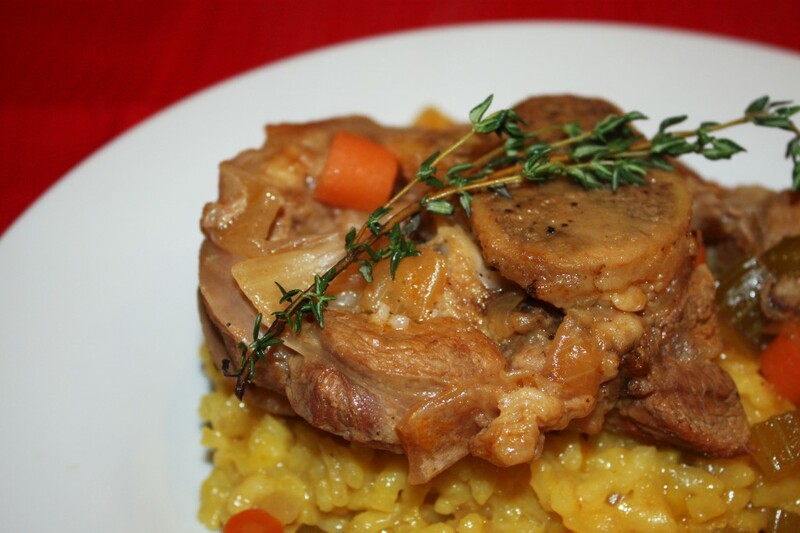 I paired the Osso Buco with Saffron Risotto and course a nice glass of wine! Next time around I will adapt the Osso Buco recipe for the crock pot….gotta figure out how to have gourmet on the weeknights! I will also find thicker cuts of veal shanks. Mine were too thin and the twine just slipped off. Enjoy!! This entry was posted in Main Course and tagged Italian, risotto, saffron, veal. Osso buco was a delicious success! Thanks so much for posting this! !